MANPATS-S is best-in-class simulator using a combination of exact weapon replicas and real-time 360° VR environments displayed in an integrated micro monitor in the aiming device. Up to 6 wireless systems can run simultaneously ensuring superb training. Several RGW90 and PZF3 systems have been successfully deployed around the world. MANPATS-S can be modified to any system (ALAC, NLAW, RPG, etc.) and can be raised to tactical level in combination with our GCD and/or G-DOME solutions. M-S is a mortar crew trainer for training in all weapon use procedures with focus on the entire firing cycle. Patented ‘Intelligent grenade’ design ensures that all possible procedures are properly trained. Up to 6 systems can be wirelessly connected into simultaneous real-time training. M-S design allows rapid modification for different types of mortars (from 60 to 120 mm). M-S can be delivered in combination with FO-T, GCD and/or G-DOME, elevating trainee immersion to unprecedented level of realism. FO-T is an artillery Forward Observer simulator. It is designed for effective training in tactics, techniques and protocols, from target identification to elimination. FO-T features accurate representation of the splash effect and damage impact on various targets in 360° VR environments. FO-T is universal as it is built on common military or technical procedures defined in STANAG 2934 and STANAG 2484. FO-T can be delivered in combination with G-DOME solution, elevating trainee immersion to best possible level. 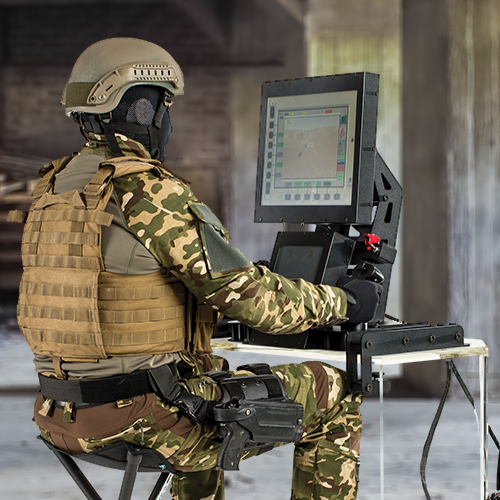 RWS-S is fully modular system for realistic training of entire remote weapon station crew. It features best-in-class gunner, commander and driver training of any (wheeled or tracked) vehicle equipped with a remote weapon station. The patented modular design ensures interactive multiuse and complete interoperability with any given system. With smart-in-vehicle installation feature realistic training environment is ensured. Various versions of RWS-S systems have already been deployed worldwide. VC-S is a medium fidelity training system for training and education of crews and crew commanding staff for all variations of wheeled and tracked vehicles. VC-S features simultaneous tactical training of multiple crews on a common battlefield. Controls and gauges are either physically replicated or displayed on touch screens, covering all elements of working environment. VC-S is easily transportable simulation system as each cabin is housed in a custom made protective frame that fits on a standard Euro palette. This patented invention is the only non-laser-based dome training environment on the market. It is one-of-a-kind personal weapon (from sidearms to anti-tank weapons) trainer featuring highly immersive tactical training. Patented IR-LED technology, highly advanced VR environments and unique real-time skeleton recognition and tracking technology, enables one-of-a-kind trainee evaluation. The system gives trainees the ability to freely move within the G-DOME area without any additional gear. The GCD is the ultimate all-in-one solution for instructors and trainees for exercise planning, execution and evaluation. It can be added to any Guardiaris product. Revolutionary design eliminated the mouse and keyboard and all interactions are executed only with fingertips. Large multi-touch screen and touch friendly user interface guarantee shortest possible time spent in exercise planning and preparation and secures best-in-class After Action Review procedure.